Health & Fitness Blog Finalist! 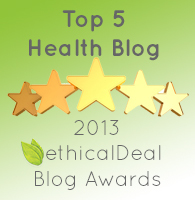 Thank you to everyone who nominated us for the ethicalDeal ecoBlog awards. Great News! We are one of the Top 5 finalists in the Health & Fitness Category. The real test begins now. Voting has started and the winner will be announced on January 18th. We are grateful to be part of this wonderful group of bloggers whose passion is to share ideas and knowledge about fitness, health and wellness. Thanks, again. Voting ends on January 17th, so please vote now! This entry was posted in ethicalDeal Blog Posts. Bookmark the permalink. 2 Responses to Health & Fitness Blog Finalist! This healthy alternative helped me to quickly add vitamins, necessary nutrients and fiber into my diet. and can be taken in high amounts withh no side effects except for awesome health. What is is greatly concerned with thee direction they look.